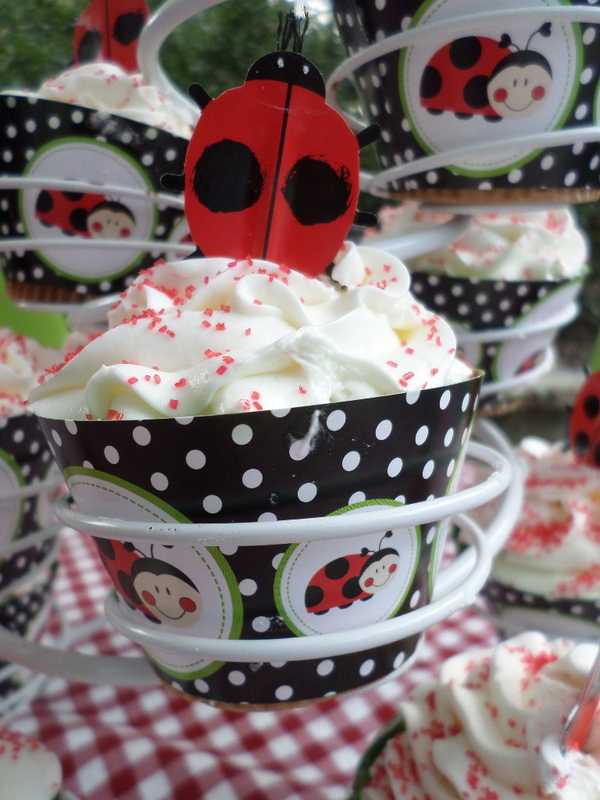 Implement these Ladybug party ideas for a fun celebration that's sure to bring lots of smiles. 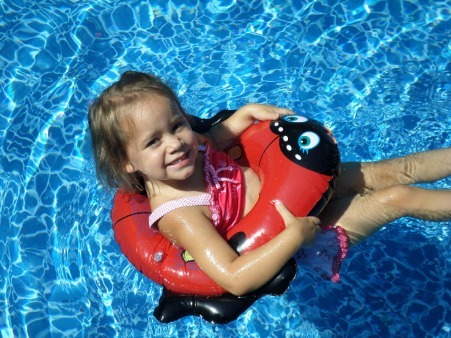 From beach balls to splash balls kids will bring home loads of memories. 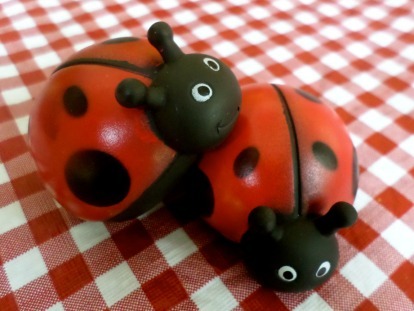 I love the deep red and bold black color scheme that reflects the true colors of ladybugs. 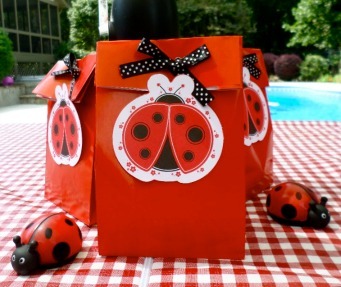 Of course the ladybug birthday party invitations set the theme for the pool party and the color scheme. 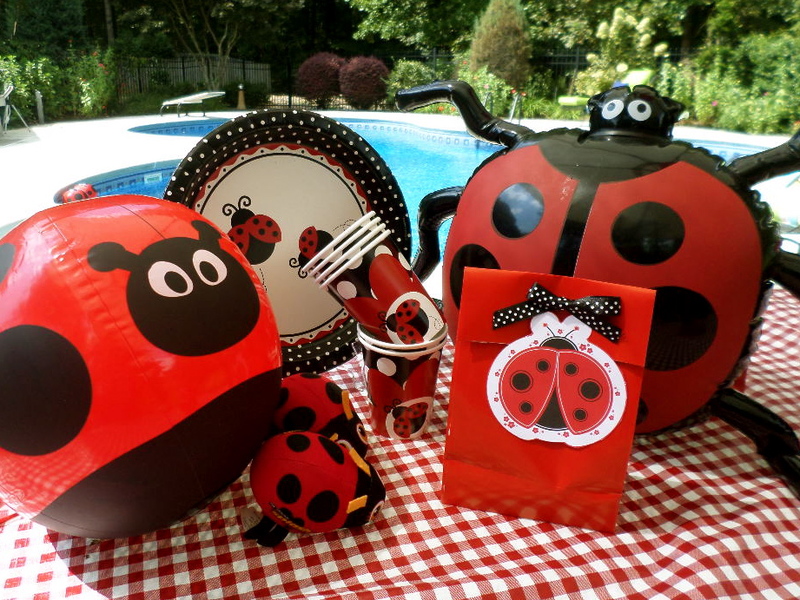 Red and black is repeated in the paper goods, decorations and pool floats. I bought these cute invites from Amazon for less than $4 for 8 of them. 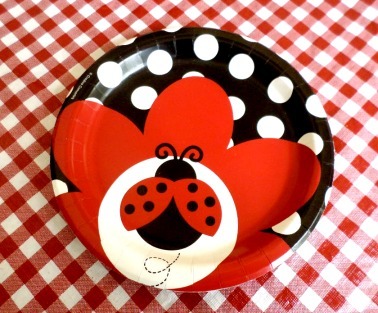 Aren't these plates just fun and cute?! The colors really are vibrant and while, I often don't rave about the paper goods - this time they really do help make the party. 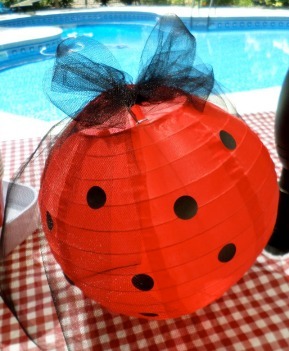 I used red and white checkered round umbrella tablecloths for the party tables. There is a whole package deal you can get from Amazon with matching plates, cups, napkins, silverware, invites, ribbon and balloons. 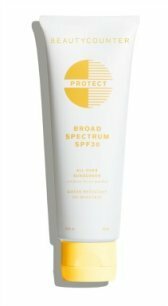 You get 100 of them for $3.00 with free shipping at Amazon. 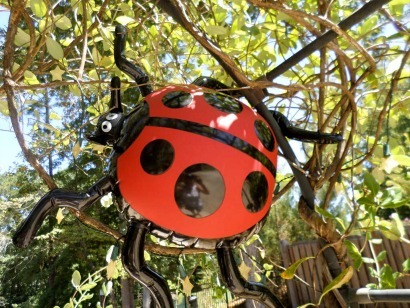 Tie a black bow around it and I had this ladybug sticker that we put right on the top. Use the same idea for your utensils. Place black forks in the red pot. I bought these little pots at Hobby Lobby for around $1.00 a piece. 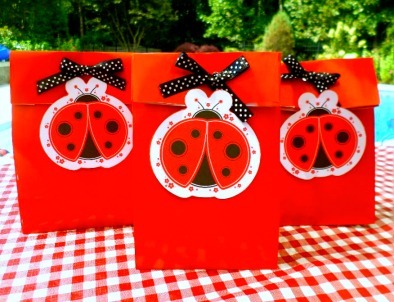 Red Paper Party Favor Bags are folded over and embellished with ladybugs party tags that I made from cutting them out from a set of invites. The black and white ribbon came from me having left over ribbons from the first set of invites because I bought 2 packs. 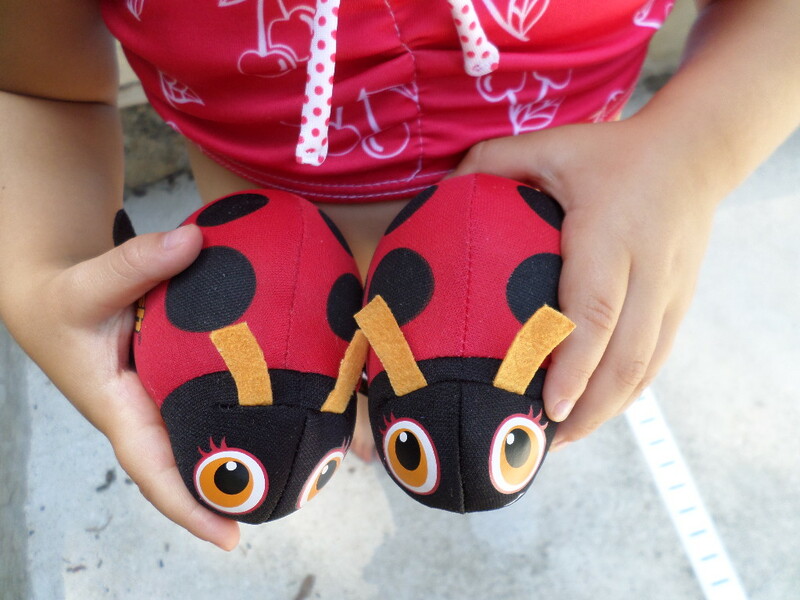 For our ladybug party favors we included these squirt toys in the party bags along with some stickers. 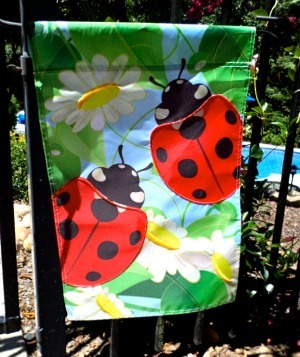 Guests are greeted with a ladybug flag - I found this a year ago at CVS and bought two of them - an extra one to hang on the pool gate. Here's another garden flag by Carson that's just as cute. 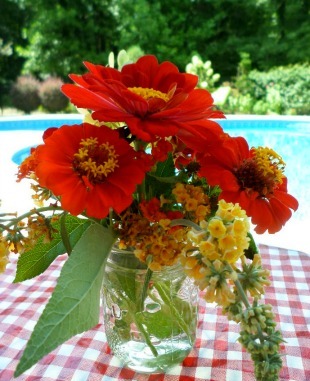 Flowers from our garden are arranged in simple mason jars and put on the party tables. Zinnias and blossoms from our yellow butterfly plant not only look pretty but smell wonderful. I use not paper - but nylon hanging lanterns because they now cost just about the same price and it doesn't matter if it starts to drizzle or if it's really humid outside. Hang them from your umbrella ribs and embellish with round black stickers and curling black ribbon. 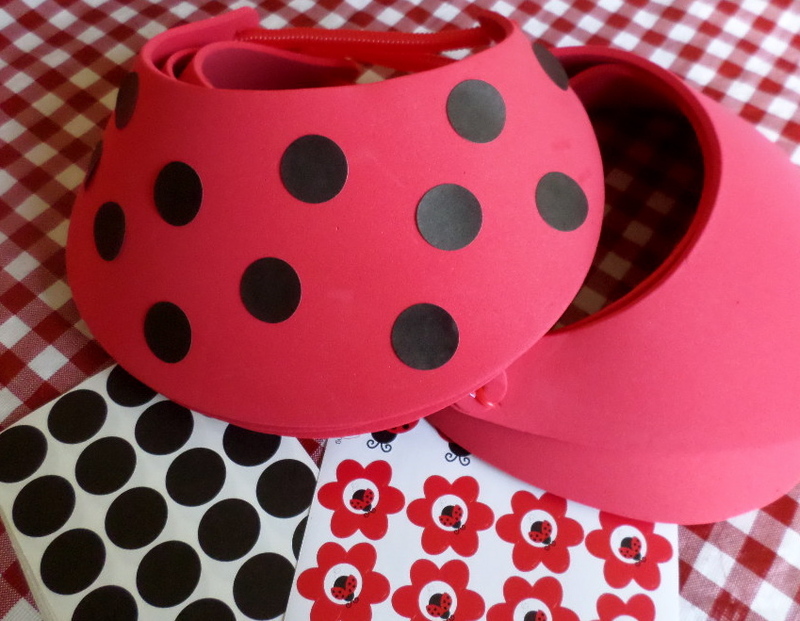 You'll use the round black stickers for a cute craft too. 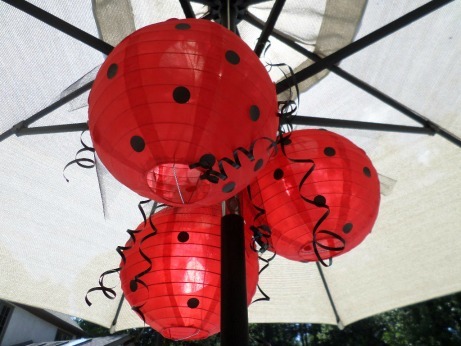 I used black netting ribbon to tie the lanterns onto the umbrella ribs. 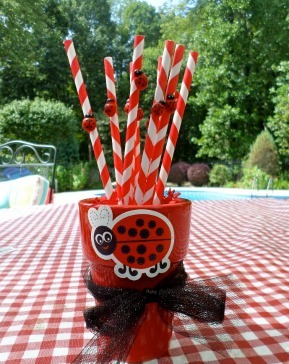 Place your party bags around the umbrella pole and add a couple of ladybugs for your party table decorations. 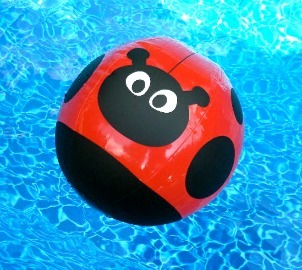 Get a couple of inflatable ladybugs to float in the pool when the guests arrive or hang them in low branches of trees. 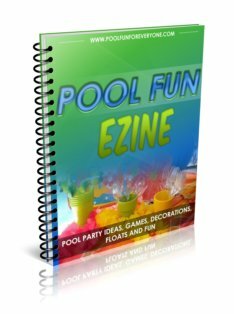 Get at least two so you can use them for pool games too. 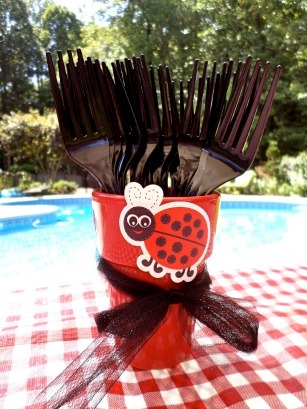 Cupcake wrappers and cupcake toppers complete the black and red color theme. I bought this cute cupcake decorating set at Pier One a year ago. I purchased white cupcakes with vanilla frosting from Publix - they are the best cupcakes by the way. So moist and the frosting is delicious. Sprinkle a little red sugar on the top. 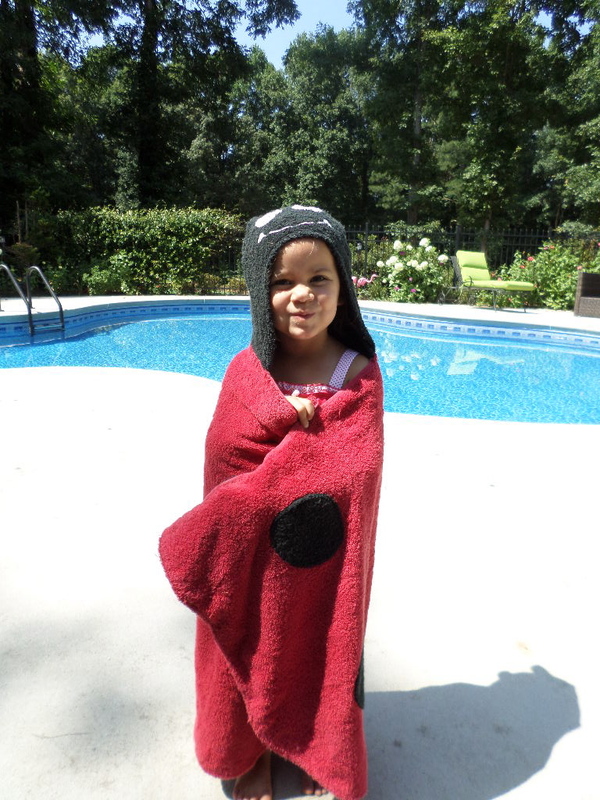 The birthday girl got her own ladybug hooded towel She kept it at her Nanna's house - that's me - and made sure we always used it whenever she came over. I couldn't believe I found these cute splash balls just before our party at Kroger. 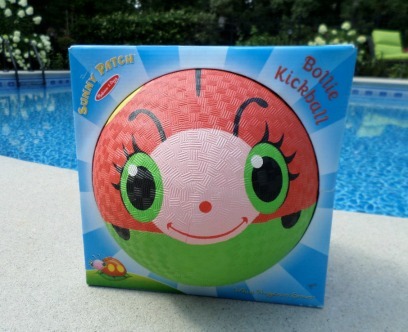 Bought enough for everyone to take one home, but before that there was lots of fun just throwing them around in the pool. Our birthday girl loved her new Melissa and Doug bouncing ball. 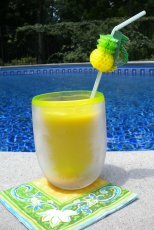 Themed beach balls float in the pool and are used for pool games for kids and as take home party favors. 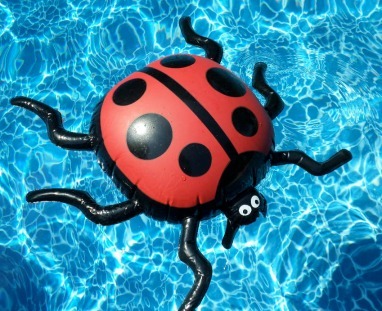 Holding the inflatable lady bug on your stomach race across the pool and back - give it to the next team mate. The team that finishes first wins. Themed swim rings are used for races across the pool. This one is small and fits up to 4 or 5 years old.